1. What is ‘benami’ and when can a transaction be termed a ‘Benami Transaction’? Webster’s dictionary defines the term, “Benami” to mean : made, held, done, or transacted in the name of (another person).1 Thus, a Benami Transaction, in common parlance, refers to a transaction in which a property is transferred in the name of a person, whereas the consideration for the same is paid by some other person. To illustrate, where X purchases a property, let’s call it ‘Black Acre’; however, the property is not purchased in his own name, but in the name of ‘Y’, though the consideration has flown-in from X only. This would be a classic Benami Transaction. The subject matter of such a transaction (‘Black Acre’ in this case) is called a “benami property”. Usually, any Benami Transaction would have two primary actors: a beneficial owner (Mr.X, in our example) and a Benamidar (Y). Benamidar is a real or a fictitious person in whose name the Benami Property is transferred or held. A beneficial owner, on the other hand, refers to the person, whether his identity is known or not, for whose benefit the Benami Property is actually held by a Benamidar. Simply put, a Benamidar is a mere name lender; a mask or a facade, whereas, it is the beneficial owner who is the real McCoy. The law governing Benami transactions in India is the Prohibition of Benami Property Transactions Act, 1988, which was comprehensively amended and streamlined in 2016 by way of extensive and rather far reaching amendments. 2. 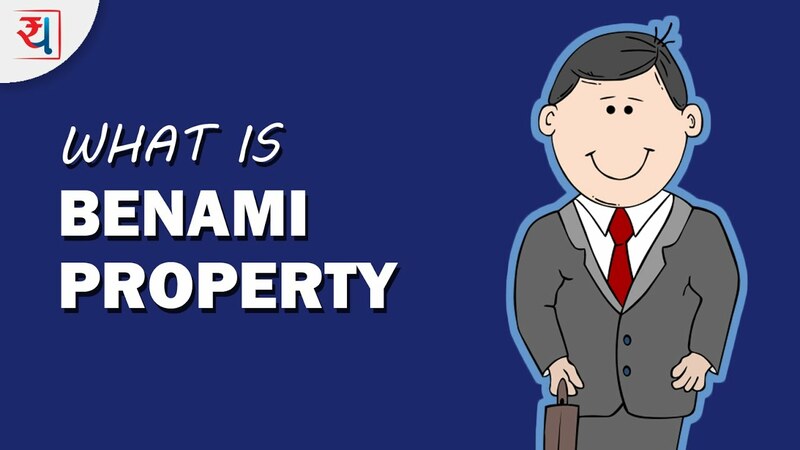 What is a ‘Benami Property’ ? It must be noted that, contrary to popular misconception, the application of benami law is not confined to immoveable properties alone. The term ‘property’, for the purposes of Benami, is quite wide and includes within its wide ambit : assets of ‘any kind’; whether movable or immovable, tangible or intangible, corporeal or incorporeal; and not only that, it also includes any right or interest or legal documents or instruments evidencing title to, or interest in the property and where the property is capable of conversion into some other form, then the property in the converted form is included as well. In fact, the proceeds from the property are also included within the definition of ‘property’. Though mostly houses, cars and jewelry have traditionally been considered to be property for the purposes of Benami Law; however, under the new definition, even securities, shares and intellectual property can be considered ‘Benami Property’ and may attract the rigors of the Benami Act. This expansion of the definition by the 2016 amendment reflects the legislative intent of intensifying the crackdown on such practices. 3. What is a ‘Benami transaction’? All these transactions would fall within the ambit of ‘Benami Transactions’ within the Benami Act. Benami transactions have been a part of Indian society for a while. One of the earliest instances of recognition of this practice can be traced to a Calcutta case wherein – a person purchased property in the name of his wife, and the same was held to be fictitious and therefore invalid.4 However, in the next few decades, the judicial stance towards Benami became a little less certain and there was considerable ambivalence with respect to the legality of the concept. The Privy Council in fact observed that the idea was quite unobjectionable.5 In fact, in some decisions, the Courts went on to observe that certain benami transactions were customs of the country and must be recognized as such, thereby giving it a veneer of legality, since custom was one of the important sources of law back then. However, gradually it was realised that Benami Transactions were also being employed for various dishonorable motives, including but not limited to, money laundering and evasion of taxes. It was also realized that these transactions could be mere facades and misused for diverting one’s assets in another’s name and thereby defeating the lawful claims of creditors and defrauding them. Slowly and gradually it dawned that, on a cost-benefit analysis, the losses and mischief arising from allowing benami transactions to continue unabated far outweighed their perceived advantages, leading to such transactions being forbidden by law. As we’ve seen above, there is a complete embargo on entering into Benami Transactions. Therefore, if X purchases a property in the name of ‘Y’, it quite clearly a Benami Transaction and X cannot file a suit seeking the recovery of the property back from Y. Any such suit would be barred by law and capable of being rejected at the very threshold. However, does this mean that Y, who was a willing partner to this illegality, continues to enjoy the property. The Answer is No. Under the 1988 Benami Law regime there were no specific provisions for attachment and confiscation of such properties. However, the 2016 Amendments provide for an elaborate process for attachment and confiscation of such properties. Therefore, now, apart from the disability attached to recovery of such a property at the behest of someone claiming to be the real owner, Benami Property is also liable to attachment and confiscation under the Benami Act. However, issuance of prior notice is not a condition precedent to attachment always. Like other similar legislations such as Prevention of Money Laundering Act (“PMLA”) and Income Tax Act (“ITA”), Benami Act, in order to prevent wrongful alienation/dissipation of property, and since time is of the essence in some of these cases, also provides for a ‘provisional attachment’ of property suspected to be Benami, provided the initiating officer has a reason to believe that the person holding such Benami property may alienate the property, and render the proceedings infructuous. In such cases, the property can be provisionally attached for a period not more than 90 days, purely as a protective/interim measure. Since a provisional attachment is carried out on the basis of a ‘reason to believe’ (which is a much lower threshold than positive proof), and it makes serious in-roads into a person’s right to property, as a check and balance, the approval of a higher official (“Approving Authority”) is made a condition precedent for a provisional attachment. Needless to state, the Initiating Officer as well as Approving Authority have to form an opinion that provisional attachment is absolutely imperative, on the basis of tangible and cogent material and not on the basis of conjecture. If the Initiating Officer is of the opinion that such property ought to be provisionally attached, she may order provisional attachment of the property, initially for a period of 90 days from the day of issuance of notice. This attachment cannot be for a period of more than ninety days from the date of issuance of notice described above. Within that period, the Initiating Officer, after giving a reasonable opportunity to the Benamidar as well as the beneficial owner to put forth their side of the case, may either confirm or vacate the provisional attachment. In case of confirmation of attachment, the matter is then referred to the Adjudicating Authority (“AA”) under the Act for its decision (on merits) and the attachment continues till a final disposal of the case. The notice is given to the concerned parties in order to give them an opportunity to demonstrate as to how the property in question is not a Benami Property and, therefore, not liable to confiscation. The notice will provide a period of a minimum thirty days to the person to whom the notice is issued to furnish the information sought and make out a case of release of property. A reply can be filed to the notice issued by the Adjudicating Authority so as to apprise the Authority as to the correct facts and one’s answer/defence on the merits of the case. Where in the course of proceedings before it, the Adjudicating Authority has reason to believe that a property, other than a property referred to it by the Initiating Officer is Benami Property, it may extend the scope of the reference and provisionally attach that property as well. Having said that, in case an appeal against the decision of Adjudicating Authority is filed, confiscation will be subject to the result of appeal proceedings. Once an order of confiscation is passed, the power to receive and manage the property, rests with an Administrator, notified by the Central Government for that purpose. After the order for confiscation has been made, the Administrator will proceed to take the possession of the property. She will, by notice in writing, order within seven days of the date of the service of notice to any person, who may be in possession of the benami property, to surrender or deliver possession thereof to the Administrator or any other person duly authorised in writing by him in this behalf. In the event of non-compliance of the order or in a situation where taking over of immediate possession is warranted, for the purpose of forcibly taking over possession, the Administrator can take police assistance and it shall be the duty of the officer to comply with the requisition. In certain exceptional cases, a writ petition may be filed against the orders of the Initiating Officer or the Adjudicating Authority, before the High Court directly. This option can be explored in cases where the orders of the Initiating Officer/Adjudicating Authority are patently arbitrary or perverse or when there is a clear violation of principles of natural justice and/or fundamental rights. Jurisdiction of the High Court can also be sought in cases of a clear violation of the procedure established under the Act by the Initiating Officer/Adjudicating Authority, or where the Act’s validity itself is suspect, or where there is no adequate remedy provided by/is capable of being availed under the Act. 10.3. Property held in the name of spouse, children, etc. A transaction which involves allowing the possession of any property to be taken or retained in part performance of a contract, if, under any law for the time being in force,— (i) consideration for such property has been provided by the person to whom possession of property has been allowed but the person who has granted possession thereof continues to hold ownership of such property; (ii) stamp duty on such transaction or arrangement has been paid; and (iii) the contract has been registered. Let us imagine a situation where X purchases a property called ‘White Acre’ with the help of a loan from Y, however, X, instead taking money from Y and paying it to Mr.Z , the owner of White Acre, instructs Y to pay the money directly Mr.Z, which Y does. Whether in that case, the transaction can be called Benami, or not? A literal/formalistic/positivist application of the Benami Law would seem to suggest that it may be a Benami Transaction, since consideration has admittedly flown-in from a third person (Y) and property is held in the name of another (X). However, in such a situation, the most crucial consideration would be : whether the property is held for the immediate or future benefit of ‘Y’, or is it a case of pure financial assistance, and Y has no stake in the property. In a situation such as this, it would have to be seen as to what the real intent of the transaction was, and whether it was, or was not executed for an illegal purpose, such as defrauding the exchequer or creditors. The mischief of Benami Law would be attracted only when a property is held in the name of one, but the enjoyment of the property and real ownership is with another person who had contributed funds for purchase of the property. As opposed to this, the transferee in a property purchased through money taken as loan, would be in the safe harbour if it is shown that both real title and beneficial interests are with the transferee and the consideration had flown from a third party merely as a matter of convenience and on the basis of an underlying financial arrangement, bona fide in nature. In any other view would result in all transactions of purchase of property through assistance from financial institutions treatable as Benami Transactions.25 An interpretation that leads to such absurdity ought to be avoided. 12. Is the new Benami Law applicable to older transactions or only those entered-into after 25.10.2016 (i.e the date of commencement)? As per Section 3(2) of the Act, whoever enters into any benami transaction shall be punishable with imprisonment for a term which may extend to three years or with fine or with both. However, as per Section 3(3) of the Act : whoever enters into any benami transaction on and after the date of commencement of the 2016 Amendment, shall, notwithstanding anything contained in sub-section (2), be punishable in accordance with the provisions contained in Section 53 of the Act. Though the position in regard to retrospectivity of penal provisions is fairly clear, unfortunately, the legal position is nowhere as simple insofar as applicability of attachment and confiscation proceedings (as detailed above) qua transactions entered into prior to 2016 amendments is concerned. To recapitulate, the provisions relating to attachment and confiscation have been inserted in the Act only after the 2016 amendment. There is no juristic consensus on the question as to whether attachment/confiscation proceedings, in the context of Benami Law, are civil or criminal in nature. There is one view which suggests that attachment and confiscation proceedings can be initiated even w.r.t transactions carried out prior to the commencement of the 2016 Act, being civil in nature and consequences, and also since these transactions were forbidden even under the 1988 law; whereas, the contra view is that these proceedings have trappings of criminal law and penal consequences and therefore, cannot have a retrospective application. Further, it has also been argued that since the 2016 amendment widens the scope of the Act by enlarging the definition of ‘property’, any transaction relating to ‘property’, not covered by the 1988 Act, but covered post the 2016 amendments, should not be brought within the purview of the Act, lest it violates the constitutional protection against retrospective penal legislations. In the absence of clarity on these aspects, there is a need for a definitive ruling on this point and also the rather vexed and nuanced issue of difference between retroactivity and retrospectivity, which has long evaded a conclusive determination by our Courts. The Benami Act has a classic vicarious liability provision and provides for attribution of liability on the alter egos/nerve centres of the Company for an offence committed by the Company. Section 62 of the Benami Act provides that, in case it is found that a company is responsible for contravention of any of the provisions of the Act or of any rule, direction or order made – every person who, at the time the contravention was committed, was in charge of, and was responsible to, the company, for the conduct of the business of the company alongwith the Company itself; shall be deemed to be guilty of the offence. Benami law has an interesting inter-section with the Income Tax. Under the IT Act, if a person is found to be the owner of any money, bullion, jewellery or other valuable article and the same is not recorded in any books of account of the person and the source of acquisition/procurement is not explained satisfactorily, in that case, the money and value of bullion, jewellery or other valuable article is liable to be taxed as ‘income’ for such financial year at a flat rate of 77.25%, without allowing any deduction or threshold exemption. This applies only if the amount of such income is disclosed voluntarily and the applicable tax to the tune of 77.25% being paid on or before 31st of March of the relevant financial year. The penalty rate is even higher in case of non-disclosure. However, what is pertinent to be noted is that the above would apply only in those cases where the person owns the money/asset in question, which is not the case in a Benami transaction. In a Benami transaction, the person in whose accounts such assets are held is not the real owner but only a benamidar. In such a case, the above provision may not be attracted, however, the individual assessee and the beneficial owner (or true owner!) would be liable to be proceeded-against civilly as well as criminally under the Benami Act. Though the definition of property in the Act is extremely wide and there is nothing in the Act that excludes the applicability of Benami Act to Benami properties located outside India; however, in a reply to a debate on the Amendment Bill in the Rajya Sabha on 02.08.2016, the Finance Minister went on to say “What happens if the asset is outside the country? If an asset is outside the Country, it would not be covered under this Act. It would be covered under the Black Money Law, because you are owning a property or an asset outside the country…”.The reference appears to be to the Black Money (Undisclosed Foreign Income and Assets) and Imposition of Tax Act, 2015 which aims to curb black money and undisclosed foreign assets and income by imposing tax and penalties on such income. A judicial decision on this point clearing the airs is much awaited. The experience of demonetisation has revealed that, in addition to hoarding black money in the form of cash, tax evaders also heavily invest their accumulated illegal money and park it in Benami properties, whether in the form of land, property or gold. This facilitates circumvention/evasion of taxes, allows defeating the legitimate claims of creditors and facilitates money laundering. Therefore, the Act, along with its amendment, seeks to achieve a laudable motive and should be allowed its fullest play. Having said that, there is a lot of uncertainty that remains with respect to crucial issues like: application of the Act to properties located outside India, retrospective application to transactions entered-into prior to 2016, and the inter-play with Income Disclosure/Income Tax/Black Money and Company laws, amongst others. We hope that at least some of these issues would find their way into courts and get resolved judicially, or the legislators may take note, and introduce the necessary amendments clearing the airs. 1 This article has been authored by Bharat Chugh, Managing Associate/Counsel & Kushank Sindhu, Associate at Luthra and Luthra Law Offices, New Delhi. The views and opinions expressed in this article are those of the authors and do not necessarily reflect the views of the Firm. 28 Hemangini Finance and Leasing Private Ltd. and Others v. Tamilnad Mercantile Bank Ltd. and Others (1996) 86 Comp Cas 875 (CLB). Also see : Pawan Kumar Gupta Vs. Rochiram Nagdeo [(1999) 4 SCC 243], wherein the Supreme Court interpreted the phrase ‘consideration paid or provided by another person” used u/s 2(a) of the Benami Act and held as follows: “29. Section 2(a) of the Benami Act defines benami transaction as “any transaction in which property is transferred to one person for a consideration paid or provided by another person.” The word “provided” in the said clause cannot be construed in relation tothe source or sources from which the real transferee made up funds for buying the sale consideration. The words “paid or provided” are disjunctively employed in the clause and each has to be tagged with the word “consideration”. The correct interpretation would be to read it as “consideration paid or consideration provided”. 29 If consideration was paid to the transferor then the word provided has no application as for the said sale. Only if the consideration was not paid in regard to a sale transaction the question of providing the consideration would arise. In some cases of sale transaction ready payment of consideration might not have been effected and then provision would be made for such consideration. The word “provided” in Section 2(a) of Benami Act cannot be understood in a different sense. Any other interpretation is likely to harm the interest of persons involved in genuine transactions, e.g., a purchaser of land might have availed himself of loan facilities from banks to make up purchase money. Could it be said that since the money was provided by the bank it was a benami transaction?. Previous Previous post: New Insurance Laws – Its Scope And Challenges?